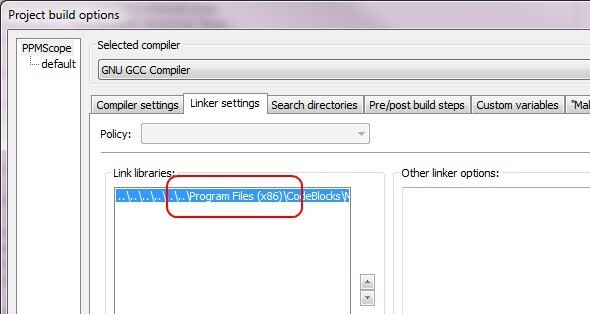 The PC Source code is compiled using the MinGW C Compiler from within the Dev-Cpp IDE. In 2006, the developers of Dev-Cpp stopped supporting the program, so I recommend using the CodeBlocks IDE with the MinGW C Compiler. The PC Source Code comes with a project file for Dev-Cpp and can be imported into CodeBlocks easily. In addition, in the CodeBlocks environment, you will need to update the library file. You can do this by selecting "Project" -> "Build Options" from the main menu. And then you should select the "Linker Settings" tab and edit the path to the library to match your install. The firmware is assembled using the MPLAB toolset from Microchip. All include files and assembly files are included under the Picasm directory.